On January 12, 1945, Lieutenant Junior Grade Hiroshi Kusumi died at the age of 22 when submarine I-53, which was carrying four kaiten manned torpedoes, launched his kaiten at 0349 at Kossol Passage in the Palau Islands. Almost immediately after being launched from the submarine, there was an explosion in the kaiten's rear machine room. The kaiten caught fire and floated to the surface, and then it sank after about five minutes. On December 30, 1944, submarine I-53 had made a sortie from Ōtsushima Kaiten Base in Yamaguchi Prefecture with four kaiten pilots who were members of the Kaiten Special Attack Corps Kongō Unit. 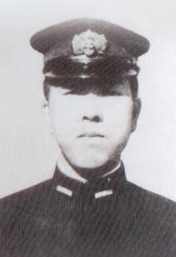 Kusumi was from Saitama Prefecture and graduated in the 72nd Class of the Naval Academy at Etajima. He received a promotion to Lieutenant Commander after his death by special (suicide) attack. During the most significant crisis in recorded history, even with my poor ability, as one foundation stone for the Empire's protection, I will join the number who will not return. As a child I deeply apologize for taking this straight road to repay your great kindness during my more than 20 years. At a great decisive battle that will determine the Empire's fate, please forgive my lack of consideration for dying before you when I fortunately can destroy an enemy ship as a human bomb. Even though it has been more than two years since I said farewell to Older Brother at Sōmagahara, his spirit always communicates with me. Even though we are apart, I have no anxiety. Regarding my dying early, do not be discouraged. I want you to think of me as a happy child when I go filled with supreme joy and without one bit of gloom in my heart. I am praying that you live tenaciously with Grandmother. Regarding arrangements after my death, if you permit me a separate sheet, I would like you to listen to two or three requests. First, if by any chance this feat is made public and there is a desire to bring my matters into the open, refuse as much as possible. By no means proclaim it before the public, and do not make a fuss. At the funeral and any other event with the family circle I firmly request that you do as I have written. Also, with any visitors definitely do not talk voluntarily about my matters. I want to sleep in peace deep in the southern seas as a nameless sakimori  who protected the Imperial reign. The letter and poems come from Matsugi (1971, 149-50). The biographical information in the first paragraph comes from Konada and Kataoka (2006, 116-8, 378), Matsugi (1971, 149), and Mediasion (2006, 86, 91). 1. A sakimori was a soldier in Japan during the 7th to 9th century who protected the western frontier of Japan. Poems written by sakimori are included in the Manyōshū, the oldest surviving anthology of Japanese poetry compiled in the last half of the 8th century. Konada, Toshiharu, and Noriaki Kataoka. 2006. Tokkō kaiten sen: Kaiten tokkōtai taichō no kaisō (Special attack kaiten battles: Kaiten special attack corps leader's reminiscences). Tōkyō: Kōjinsha. The Mediasion Co. 2006. Ningen gyorai kaiten (Kaiten human torpedo). Hiroshima: The Mediasion Co.